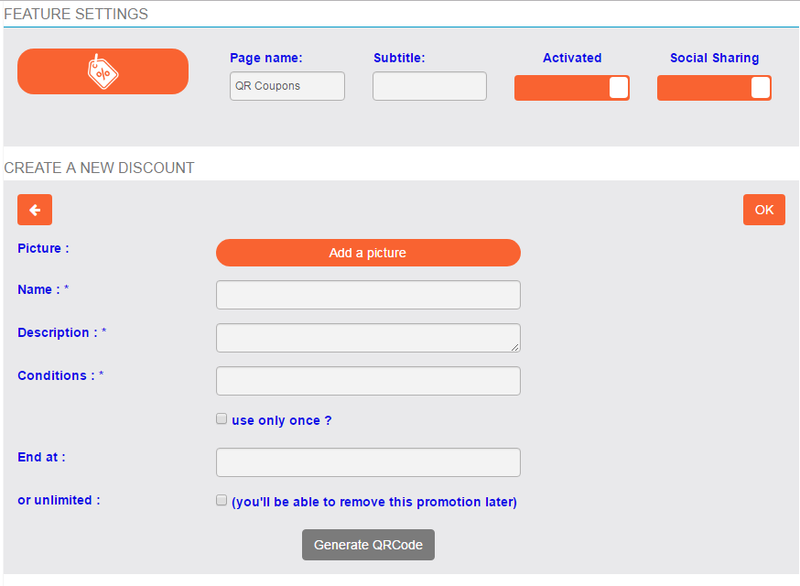 This page will allow you to create discount coupons that will be unlocked by scanning a specific QR Code. Once unlocked, the customer can use the discount when he wants. To add this page to your app, just click on from “Add pages”. Give a name to your coupon. Enter a description of your special discount. Enter the required conditions to access this discount. You can decide if you want this discount to be available only once for each customer or unlimited. Then you can decide if you want your discount to be limited in time and set an end date. But you can also decide to set it to “unlimited” and decide later when you want to stop this special offer. Once you’ve set your coupon as you want, click on “Generate QR Code”. It will create a QR Code that you can print and display anywhere you want to allow the users of the app to scan it with their QR Code Scan and to benefit from your QR Coupon!.